I’m the nerdy girl with her nose in a book | Kate Mahar writes . . . I don’t really understand why people take the time to search for stock photos and sayings to post on Facebook. The pictures may be cute or funny or majestic or whatever. And yes, the sayings are certainly clever or moving or funny or entertaining. I’m not saying they aren’t good in and of themselves. But I don’t understand why people go looking for all this stuff they didn’t write or photograph to post under their names. I’d rather know how your tomatoes are doing this season or that your cat just coughed up a hairball on your pillow and, eeuw. You know? Tell me something real, even if it’s mundane. That is so ME. It is so me, I posted it again, despite the fact that I claim NOT to be in favor of posting other people’s jokes or words of wisdom. I promise not to make this a new habit, but I had to not only post this, but also even BLOG about it. You know I had to be impressed. Anyway, I’m not actually planning to sit outside to read today, but if I were inclined to spend some time outdoors, reading would be my preferred activity. Reading is my preferred activity indoors when it’s snowing or raining. It is my preferred activity on a plane. It is my preferred activity in bed before I go to sleep. When I am traveling for business, I can’t wait to get back to my hotel room at the end of the day, put on my jammies, and read. As I write this, I think of Dr. Seuss’s “Green Eggs and Ham.” I would read books in a car. I would read books at a bar. I would read in my blue chair. I would read most anywhere. When I was a little girl, some of the best days at school were when the teachers handed out small catalogs just filled with books we could order – for our very OWN! I would agonize over the lists and descriptions of books. How many would my mom let me order? How on earth could I narrow it down to the limit imposed by her? And when the books arrived weeks later . . . euphoria! Do you remember those catalogs? Did you enjoy it as much as I did? I loved libraries so much, I can close my eyes and clearly see the children’s section in the old downtown Geneva Library where I spent countless hours as a kid. These homes for books are precious, and I visit the wonderful Madison Library regularly to load up on reading material. I love the smell of books. I love the shelves jammed with fat books and skinny books, their spines in every color of the rainbow and each title more intriguing than the next. I love looking at the shelves with the newest books. What gem might I find there? Will I be lucky enough to run across a novel that just got a great review in the Sunday paper? (If not, I’ll go online and order the ones I’m dying to read through ClevNet and wait for the electronic message telling me a copy is waiting for me at my library). If being a reader is being a nerdy girl, then I am SO that nerdy girl! There was a time in junior, then senior high school when I tried to fit in and be part of what I thought was the “cool” crowd. I certainly didn’t admit to reading anything just for the pleasure of reading. At the time, induction into National Honor Society was conducted at a surprise assembly in front of the whole school. I remember thinking my cover was blown when my name was called during that assembly junior year. Crap. My inner nerd was on display for all to see as I stumbled up to accept the pin or certificate or whatever they gave us, my parents smiling in the audience. I kind of felt like a phony in either camp, to tell the truth. Anyhoo. 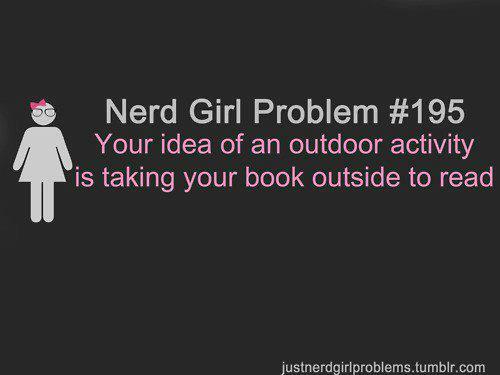 It’s too damned hot to sit outside and read. This summer has been brutal! But here’s what I’m reading at the moment: “My Korean Deli” by Ben Ryder Howe. Very funny, so far. Last night I read a little book about dachshunds and chunks of the book by Cesar whoever, the Dog Whisperer (no information helpful with Mick and his random pooping, I might add). If you love to read, too, why don’t you join me on www.goodreads.com? For book fanatics like me, it’s kind of fun to try to keep a list of what you’ve read, keep another list of books you keep meaning to read (I finally remembered to bring it to the library with me yesterday and picked up “The Hummingbird’s Daughter” to read next), and to see what other people are reading and recommending. And if you have any great suggestions, post them right here in the comments! Nerdy girls (and guys) rock, don’t you think?